These are fun! Here are 4 from me, using assorted strings and scraps from my vast collection. 😉 I am always happy to get rid of some of these scraps, so thank you Sophie. 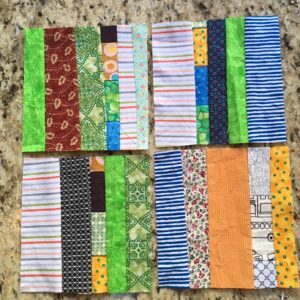 I tried a couple of different methods because some of my scraps are a bit wonky and I was concerned about getting the blocks to lie flat. I pieced one of the blocks just by sewing the strips together, but for the other three I used foundations: one was a “permanent” piece of foundation fabric that I’d bought in a quilt store ages ago and cut to size; the other two I just cut 6.5-inch squares from scrap paper and sewed the strips to that, using a short stitch length on my machine so it would be easy to tear away the paper when I was done. All of them worked out fine, but I find it easier to use some sort of foundation when working with strings. I love the variety in your scraps. Thanks for sharing your experience using the different methods and different foundations. Jane Hall, a quilt book author/teacher and foundation piecer always uses foundations, even for something like a keyboard border. I didn’t use foundation for these blocks but for the quilt I just made I used pages from telephone book. Easy to rip off and it doesn’t bleed.